Cowboy and JellyBean helping out with cleaning the barn and fertilizing the garden. 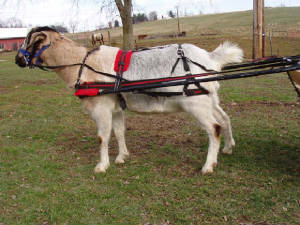 Harness goats are very useful, Once one is trained it can be a great asset to a farm. They can help with cleaning the barn, pulling firewood, help move square bales, or anything you can think of. Althought George is no longer with us, his story and legend lives on. 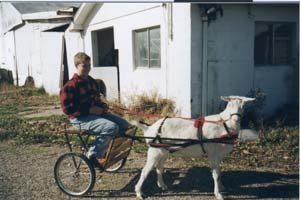 In 1996, I became interested in goats at our local fair. I had be taking dairy cattle since I could remember and wanted to take something new. Well, at that time the only projects at the fair were pygmy goats and market wethers. I decided to take a market wether. We went out to the breeder's house and picked out the best goat there was. I took him to the fair and didn't win Grand Champion, but I was still happy. We took home our goats and shortly after that my grandparents sold George to a friend so that they could also enjoy the companionship a goat can give. 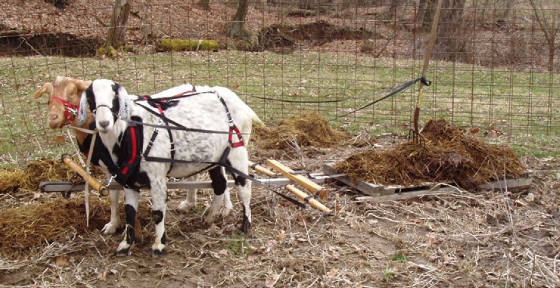 So, this is how I got started in harness goats. I wanted a goat that I could keep and wouldn't have to sell. That year I got a young Nubian/Boer wether and named him Cooper. 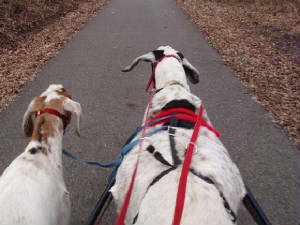 He would come up to you and just wanted to be petted, that why I picked him as my harness goat. I took Cooper to our fair for 3 years. Sadly, after returning from the fair, Cooper was tied on the hill to graze when the rope tangled around his legs and he fell and he couldn't get up. The halter on his noise pulled so tight that it cut off his air supply and he passed away. That evening at my grandparents, we recieved a phone call. It was the lady my grandparents had sold George to. They no longer could keep George and was curious to know if we would like him back. So, the next day my long lost friend George came home. Once he got aquinted with the farm again, I wanted to get started on training him for the fair next year because I only had a couple of months to get ready. I harnessed him up and away we went! George was wonderful ! He had never had a harness on in his life and he took to to it very well. 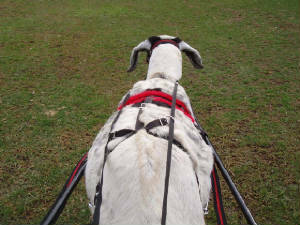 Since then George has won many awards and has won quite a few Grand Champion Harness Goat trophys. 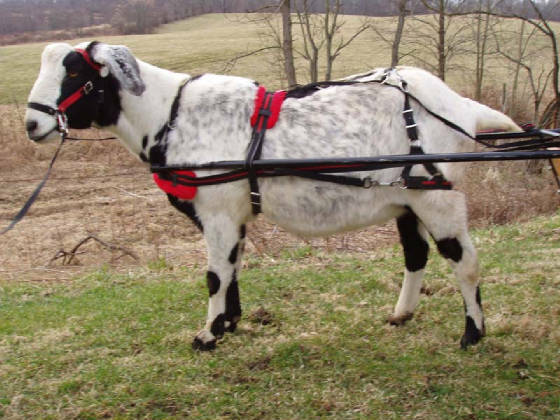 DW Farms currently has 3 harness goat. The main one being Cowboy a Boer/Nubian wether. Cowboy stands about 35" at the withers and weights in at about 260lbs. Next in line, we have DW Farms JellyBean or J.B for short. JellyBean is a Boer/Alpine that was destined for the meat market, until he had another calling. JellyBean has turned out to be a nice carter. 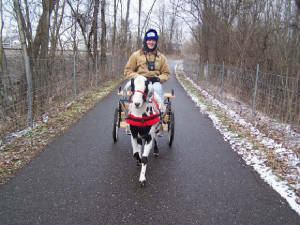 He works as a team mate to Cowboy, pulling the wagon, skidding logs or clean the barn. Up next is Benji, a fullblooded Boer wether. He is currently in training to become a better worker. Has been driving with Cowboy and is coming along great. Plans are to drive Cowboy, JellyBean and Benji 3 abreast. Life is great, when your behind a goat!